Winter is a good time to sort out pictures. I spent a rainy day browsing through last years photographs of Monet’s garden and came to the idea of making a Giverny Calendar out of my favorite shots. Here is the result, a wall calendar to accompany every Monet fans and garden lovers all year round. I hope you will like it. I did my best to choose for each month the corresponding flowers in bloom at this time of year, but of course this was not really possible for winter months. 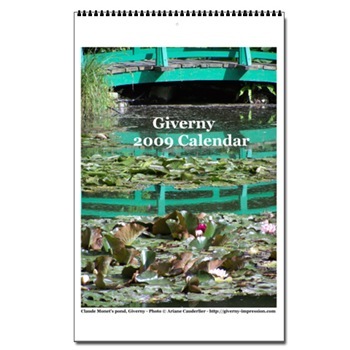 The Giverny Calendar is for sale on line for 27.99 US dollars. You can see all the pictures by clicking on the months. I would be glad to have your feedback, in order to improve next time. I wanted to show you the red squirrels we have got in France. They are very different from the striped ones that are so common in other parts of the planet. 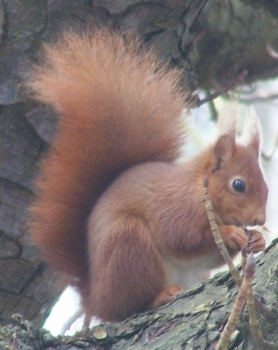 Red squirrels are generally shy, so you can’t promise to your child you will see one during your next walk in the wood. But at Fall the squirrels come closer to the houses, looking for hazels. Once the leaves are fallen they can’t hide a lot, what makes them easier to photography. It is absolutely lovely to observe a squirrel hopping on the ground and suddenly speeding up a tree. They are delightfully light and agile, which makes human beings feel clumpsy and heavy in comparison. Our bodies are so much bigger than theirs! The colors tend to disappear under the soft veil of the fog. Mist likes to stick in the Seine valley, especially on chilly autumn and winter’s days. 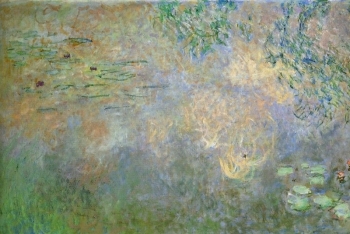 This magician creates strange effects, unreal silvery lights that linger over Claude Monet’s pond at Giverny. The usually precise lines of the reflections on the surface become less defined. Like a parenthesis of hapiness on a dull day, the pink nympheas prove that colors are not swollen by the grey shades as they are by the night, but only softened. A careful look reveals them. The surrounding greys make them even more vivid. 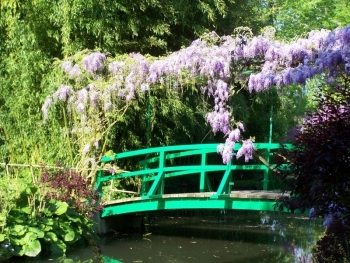 Two big wisterias top the bridge in Monet’s water garden at Giverny. One is a pale lavender, it blooms first for two weeks, generally at the beginning of May. It is followed by the white wisteria. So if you come in May you are pretty sure to see the canopy flowering. But according to the year the blooming period varies. if the Winter was mild and Spring early, the lavender wisteria starts earlier, at the end of April. On the contrary a late Winter can delay it up to three weeks. 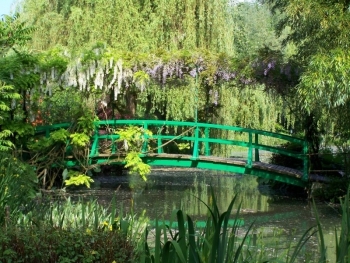 But anyway, there is always something spectacularly beautiful to admire in Monet’s garden, from April through October. 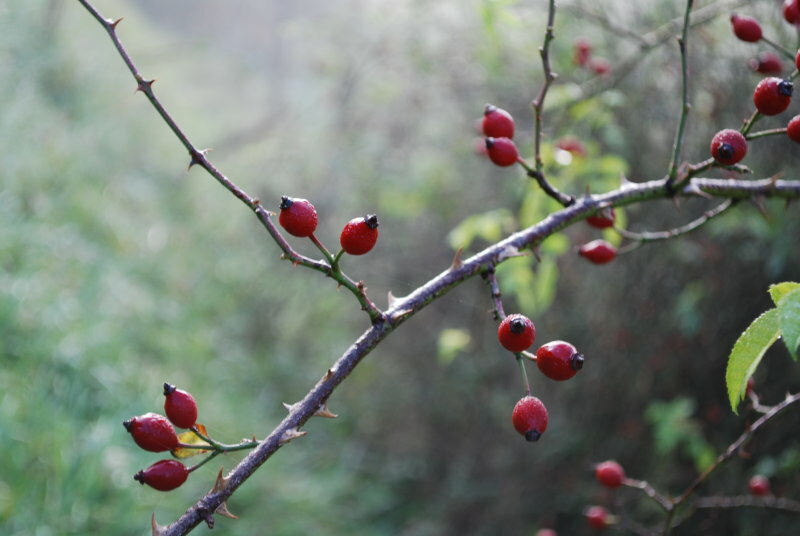 Now that all the wild roses are spent, their lovely berries shine in the morning mist. The dog roses grow everywhere in the area of Giverny, on road sides, on the bushy hills, turning the countryside into a giant garden when they are in bloom in springtime. 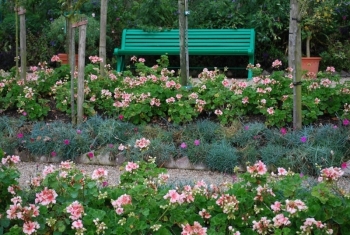 Nobody will sit on the benches in Monet’s garden anymore this year. 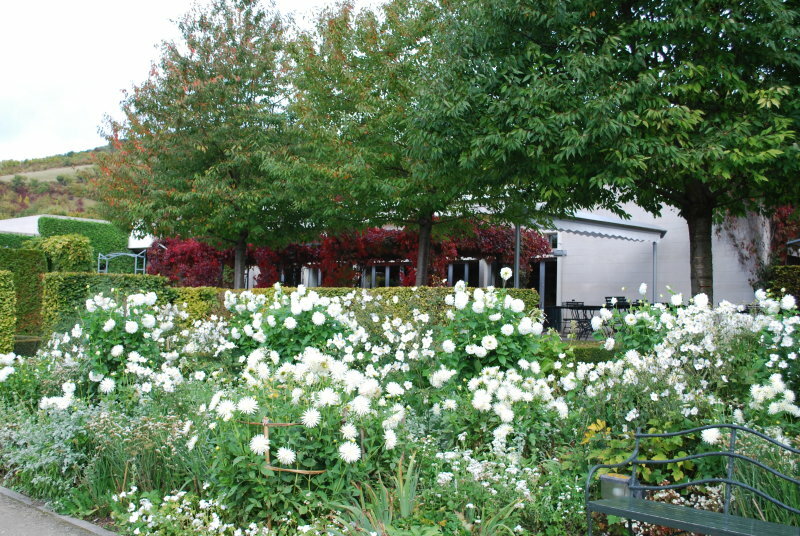 Giverny is closed for five months. Last Sunday evening, when the last tourist left the museum, the garden was still full of blooming geraniums, dahlias and of many annuals. All of a sudden, everything changed dramatically. No visitors anymore in the alleys, but the very busy gardeners. One of their first task is to put all the benches in a safe place, where they will be cleaned, repainted and repaired this winter. Another important job is to shelter the fragile flowers which are grown in pots. 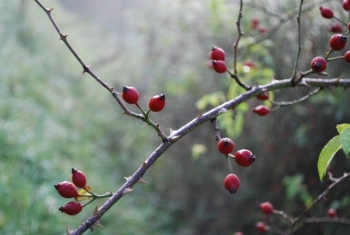 Within days all the flower beds will become empty and bare, ready to resist the first frost. But for the moment the weather is mild. Cows are still outside in meadows as green as usual thanks to the almost daily rain. In Monet’s garden the leaves of the glowing liquidambars fall silently onto the pond, whilst their admirors have gone. 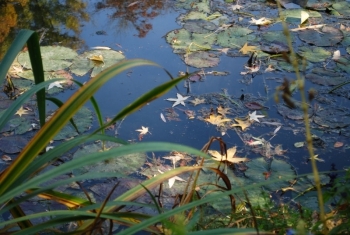 The fallen leaves of the three liquidambars look like stars picked on the surface of Monet’s pond at Giverny. They twinkle against the dark blue reflection of the sky. In 19th Century France it was a common pattern to paint murals of stars in the night on the ceilings of churches. This is the Famous Japanese Bridge that Claude Monet painted so often. 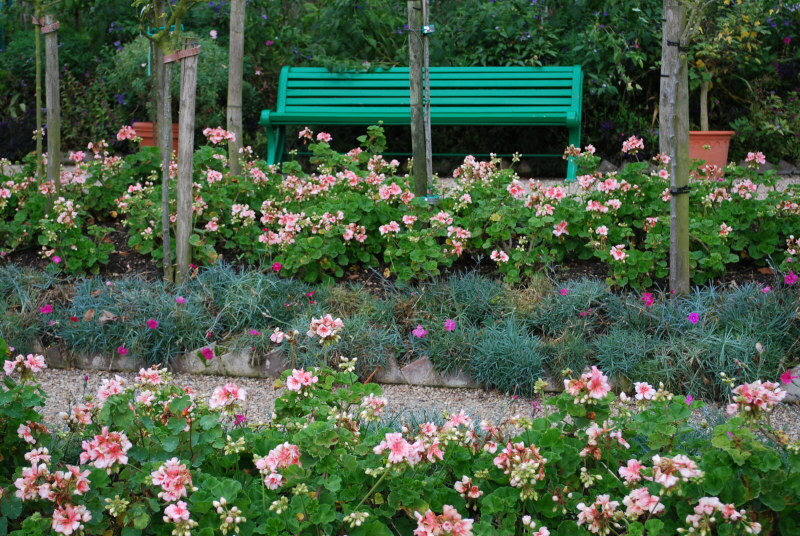 It deserves lots of capitals because it has become the icon of the painter’s garden at Giverny. In the bright sunshine its green turns almost blue, as can be observed on Monet’s paintings of this motive. The picture was made in July when the wisteria tangled on the arbor flowers for a second time. This second blooming while the leaves are out is by far more discreet than the first one in May. Fondation Claude Monet at Giverny generally closes for the Winter on October 31st, but this year Claude Monet’s home will remain open two more days on Saturday November 1 and Sunday November 2, 2008. 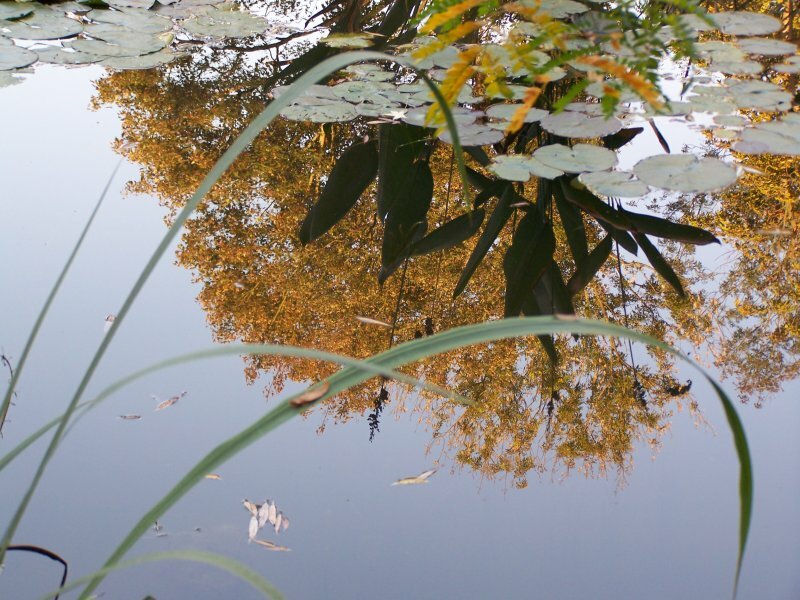 It is a unique opportunity to appreciate as late as possible in season, the changing colors of the trees around the lily pond and the warm tones of the vine on the house Monet inhabited for 43 years. Original also, visitors will be able to stroll in the gardens at sunset. It is a fantastic experience to see Monet’s garden invaded by the shades, just before it fells asleep for a five-month-winter. A big copper beech shades Claude Monet’s water garden at Giverny. It is a very old tree, dating back to Monet’s time. It must be over 100 years old, a survivor from the original garden Monet planted. In October, Autumn has come and the beech is not copper anymore but brown, as you can see from its reflection in the waterlily pond. The rest of the season this senior among the trees in the garden has strange powers. There is a magic in it: when you stand under its branches and you look up, its leaves are perfectly green. But seen from a distance they become dark red. Certainly one could find a scientific explanation for this magic, but please! don’t tell me. I prefer not to know. 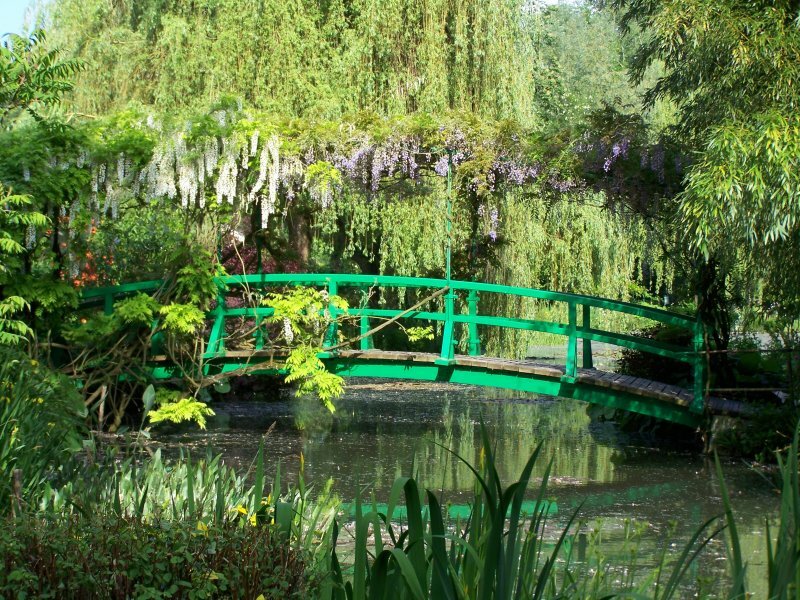 30 Monets at Giverny next year! I am absolutely excited by the news I’ve just read in the local newspaper of Vernon: next year, the Fine Arts museum of Giverny (temporarily named Impressionist Museum, but its name may change) will start its new life with an incredible exhibition. The organisers plan to obtain 30 Monets! The theme will be, obviously enough, Monet’s gardens. It seems too fantastic to be true, but I’m not dreaming. Imagine! The visitor will be able to see the paintings on the very place where they were created, to go from the canvases to the garden, from the garden to the canvases. A unique, unforgetable experience. It will be absolutely gorgeous. 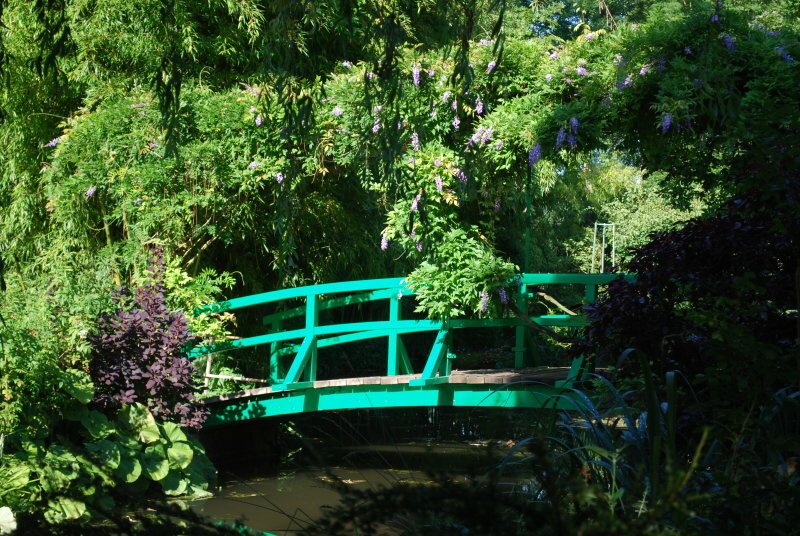 Visitors will leave Giverny their eyes full of beauty and harmony. 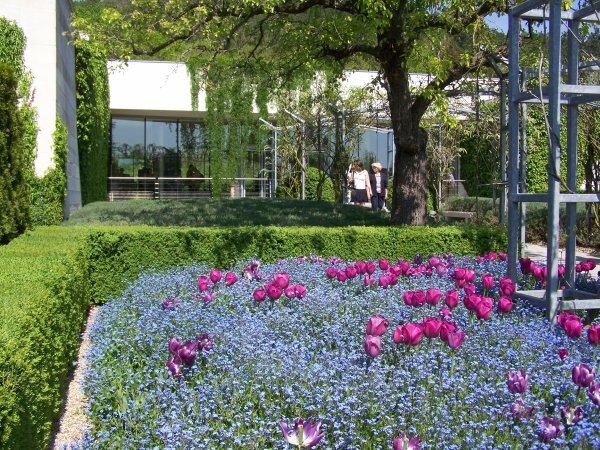 The new museum will open with this exceptional exhibition on May 1st, 2009, one month later than Monet’s home and gardens at Giverny, opening on April 1st, 2009. The paintings by the master of Impressionism will stay at Giverny through August 15th. An exhibition of Joan Mitchell‘s paintings is scheduled from August 23rd through October 31st, 2009. 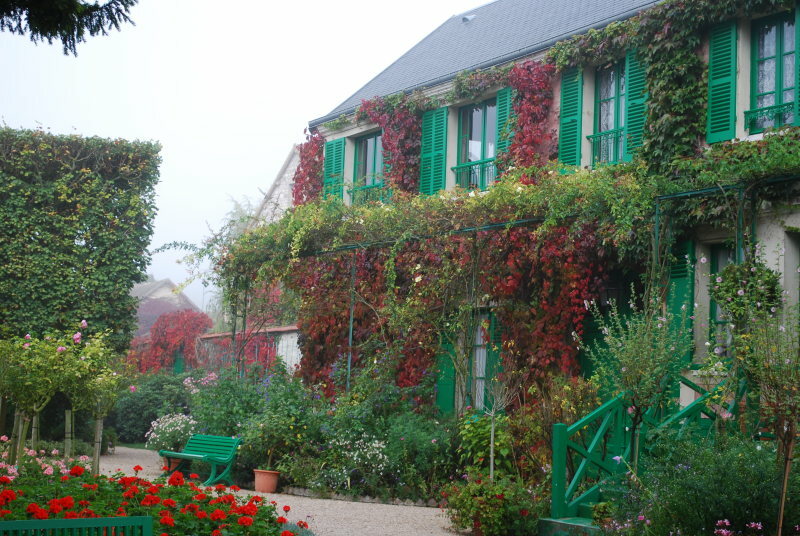 The American artist Joan Mitchell has a direct connection with Monet: she bought and lived in the house neighbouring his former house at Vétheuil, 20 km from Giverny. In the future the museum of Giverny will constitute its own permanent collection. It could be open year round. It’s hard to imagine better news, isn’t it? 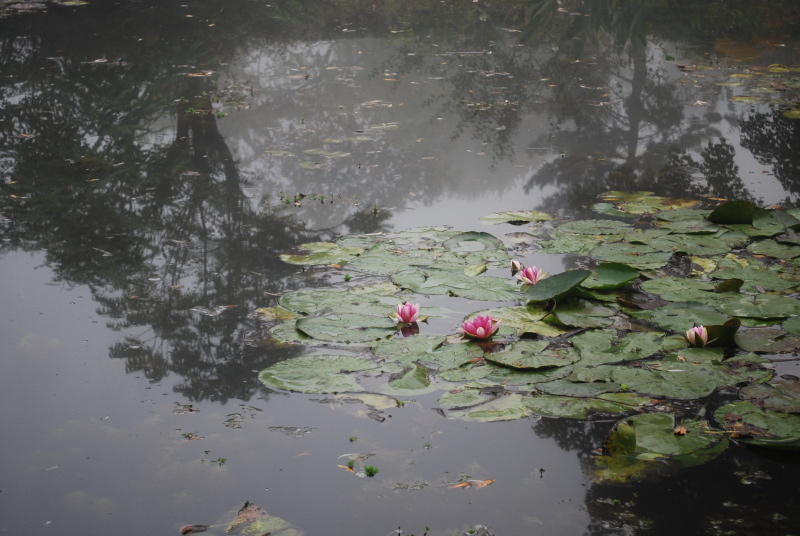 Next year, there will be a museum of Impressionism at Giverny. The Museum of American Art Giverny located next Monet’s home at Giverny is living its last weeks. Founded in 1992 by wealthy American collector Daniel Terra, the museum has exhibited American Art till now. Its visitors are mainly French individuals. They discover the Art History of the US, which is not well known in France. But Foundation Terra will stop ruling the museum next year. The local county administration, the Departement de l’Eure, will deal with the new museum. To what one can figure out as the public delight, the museum will be devoted to Impressionism. It makes sense on the very spot where Monet, the impressionist leader, painted so many masterpieces, and where hundreds of impressionist painters gathered to create Giverny artists colony. 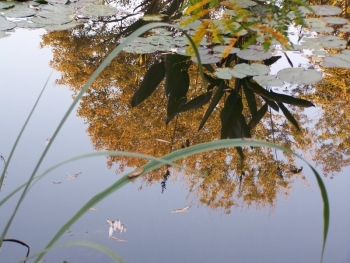 Next year some of its best canvases will take a short trip to Giverny, 80km west of Paris. The exhibition opening on 1 April 2009 will be dedicated to the most popular theme one could expect in Giverny: Monet’s gardens. It will certainly be a fantastic exhibition. Claude Monet had calculated that the light changes every seven minutes in Giverny. I wonder if he didn’t exagerate a little bit, but he had an exceptional eye and he wanted to render the slightest light changes exactly. Monet painted in series. He chose a spot he liked in his garden, a special framing of his pond, and he painted it over and over again. That is to say he had several canvases on work, sometimes ten, sometimes up to twenty. He gave a few brushstrokes on one, then he noticed that the light was changing. He would look among the unfinished canvases to find the one corresponding to this very light effect. He put it on the easel, went on with it for a few minutes. Eventually the light would change again, and Monet accordingly changed the canvas on the easel. And so on. It was a slow process: Monet had to wait until the same light effect would come back to complete the canvas. Impressionist painters don’t imagine nor remember, they paint what they can see, the impression of the moment. It is a challenge to paint a moment, for it takes many hours of hard work to paint a landscape. With many canvases on work at the same time, it could last monthes or even years before all of them were considered finished. Claude Monet made his garden famous by painting it over and over again. 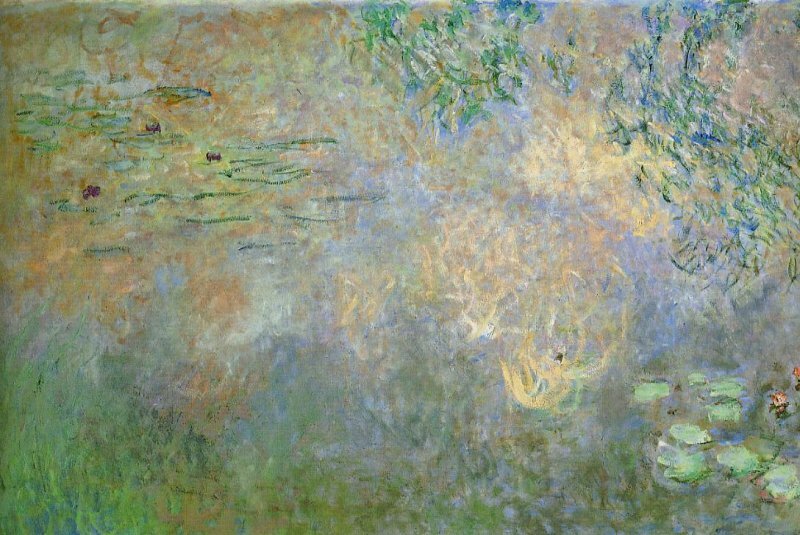 There are 272 canvases by Monet featuring his water garden, not to speak about the Grandes Decorations, these oversized panels that can be seen at l’Orangerie Museum in Paris. Monet didn’t want any other motive for almost twenty years. He was in his seventies and eighties and didn’t feel like travelling for long painting campaigns anymore. In addition there was war, the first World War from 1914 through 1918. Monet preferred to stay in his garden to paint. Here he found all the inspiration he needed. Monet painted his pond or his bridge repeatedly, because for him there were never the same. What he wanted to render was not especially a flower or a bridge, but the light on them, the air that wraps them. And the light changes all the time. Monet’s Garden at Giverny is lined by a small stream. The name of this stream is le Ru, which means the stream in french. It is not very informative! But the Ru is a branch of a bigger river, the Epte, which is meaningfull. The Epte was for several centuries the border between two kingdoms, England on one side (because the English king was duke of Normandy) and France on the other side. Between 911 and 1204 there were many castles and strongholds built on each side of the river to defend the border, and battles fought. There is still a tower remaining in nearby market town Vernon. It was the keep of the castle. And facing this castle 10 miles away, the castle of La Roche Guyon and its medieval dungeon can still be visited. Nowadays the river is a border between two regions, Normandy on one side and the area of Paris Ile de France on the other one. 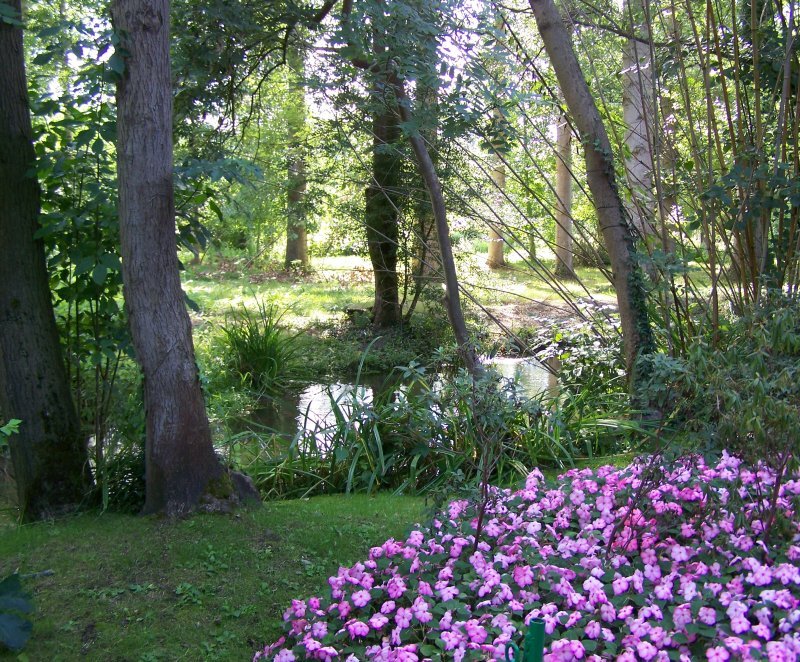 Giverny lies on the norman bank, it is the first village of Normandy when coming from Paris.